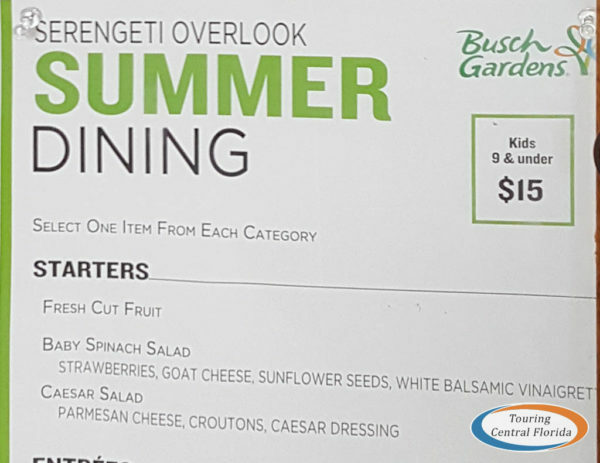 In conjunction with Summer Nights, the Serengeti Overlook Restaurant at Busch Gardens Tampa Bay has reopened on select days with a special Summer Dining Series menu. The top floor full service restaurant is scheduled to be open on Thursdays through Sundays from 11:30 a.m. to 8 p.m. through the end of the summer season. We stopped by on a recent Sunday evening to check it out. 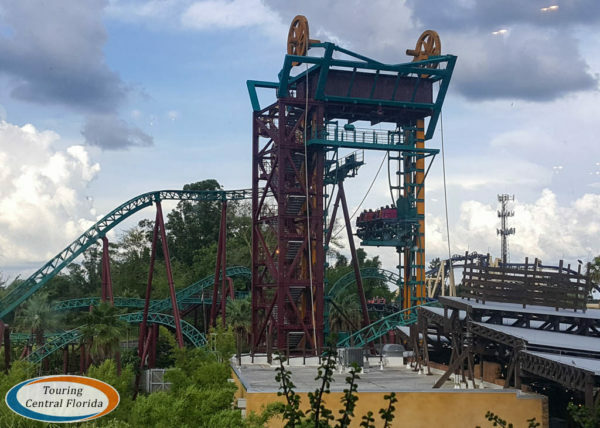 Our meal was graciously provided to us by Busch Gardens Tampa Bay, however all opinions in this article are our own. The Summer Dining Series at Serengeti Overlook uses a prix-fixe menu, where you receive three courses for one set price. There is an adult menu for $29 per person, and a children’s menu for kids ages 3 to 9 for $15. Annual pass member discounts of 10% off do apply (but the July Instant Reward for Buy One, Get One 50% Off Entree after 5 p.m. does not). There are three starter options, all salads. 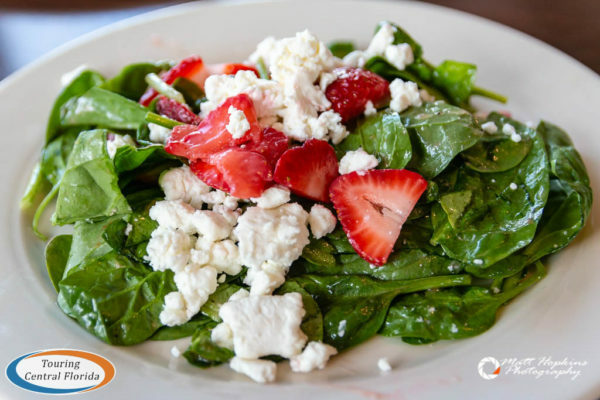 We chose the Baby Spinach Salad, which was a refreshing choice that definitely had a summer flavor with the strawberries. They were out of the sunflower seeds, which I’m sure would have added another dimension to the salad, and we would recommend getting the dressing on the side as the balsamic vinaigrette has a strong flavor. 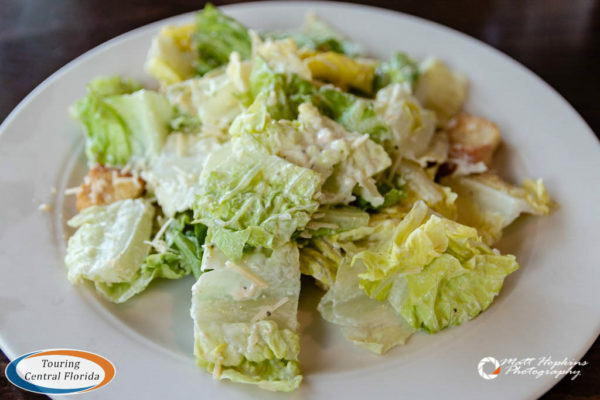 Our other choice was a Caesar Salad, which was exactly what you would expect from the standard dish. There is also Watermelon & Heirloom Tomato Salad as an option. For an entree, you have four choices. 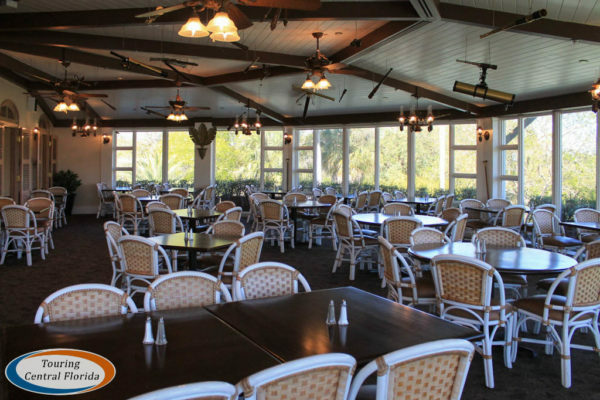 Fans of the old buffet will recognize the Signature Fried Chicken, which has been a staple on the menu for years at Serengeti Overlook and even before that when it was the Crown Colony. There is also a Vegetarian Tasting option. 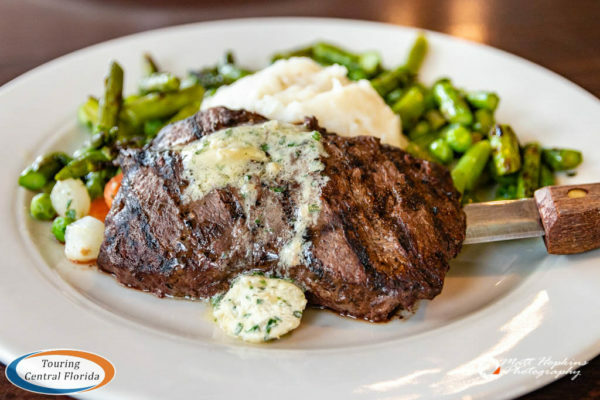 We chose the Grilled Flat Iron Steak. The steak was a good size portion, and was a nice cut with good flavor. A large portion of vegetables including asparagus, green beans and carrots accompanied the steak and potatoes. 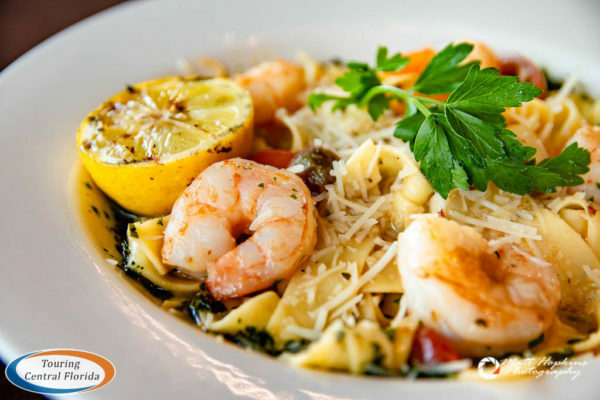 We also chose the Shrimp Scampi Pappardelle. The tomatoes gave the dish a fresh, summery taste, and the shrimp were cooked perfectly. Those expecting a more traditional scampi should note that this one lacked a strong garlic flavor, but that wasn’t a bad thing as the basil oil was an interesting choice for sauce. Don’t forget to save room for dessert, of which there are three options. 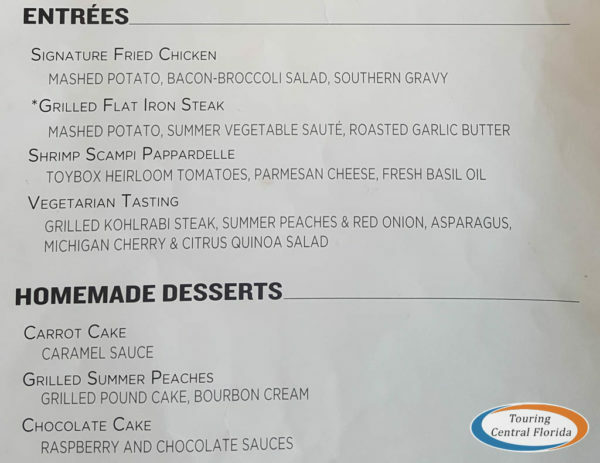 We didn’t try the Carrot Cake, but would have liked to try the Summer Grilled Peaches. Unfortunately they had run out. 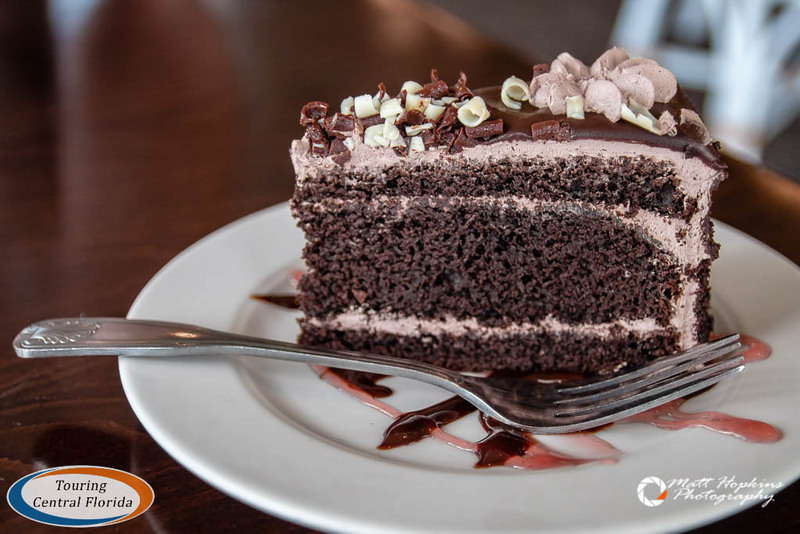 So we both chose a slice of Chocolate Cake, which was rich in chocolate flavor and a nice, sweet way to cap off the meal. 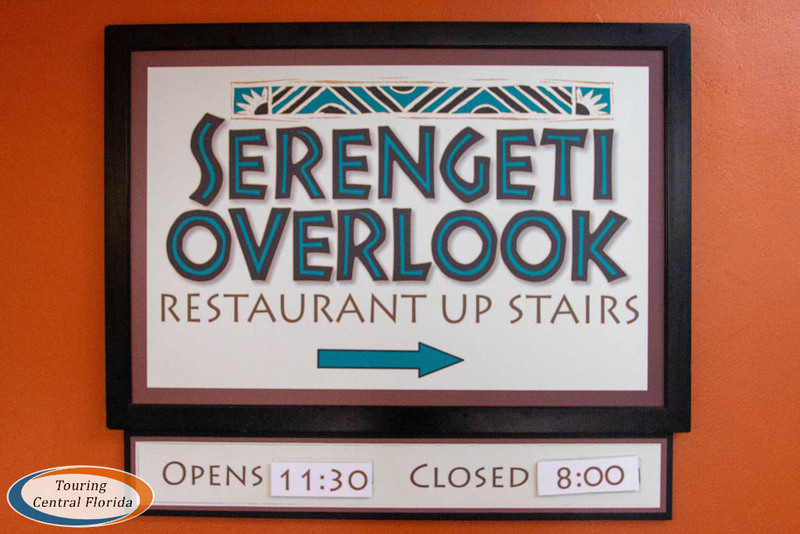 We’re very happy to see the Serengeti Overlook Restaurant open again, even if only four days a week for the summer season. After a long, hot day of riding roller coasters and viewing all the wildlife, it’s nice to be able to sit down and enjoy a more relaxed pace dinner inside the park before enjoying the rest of the evening. Overall, we enjoyed the meal and it’s hard to beat the great views from the window seats overlooking the Serengeti and Cobra’s Curse. Definitely request a seat there if possible – while the rest of the restaurant is also nice, the views make it an even better experience. Our other recommendation would be to stop by earlier on the weekend if possible since they seem to run short on some of the items come Sunday evening. While the missing sunflower seeds from the Spinach Salad didn’t make or break the dish, it was disappointing to find out the most unique and summer inspired dessert was unavailable. 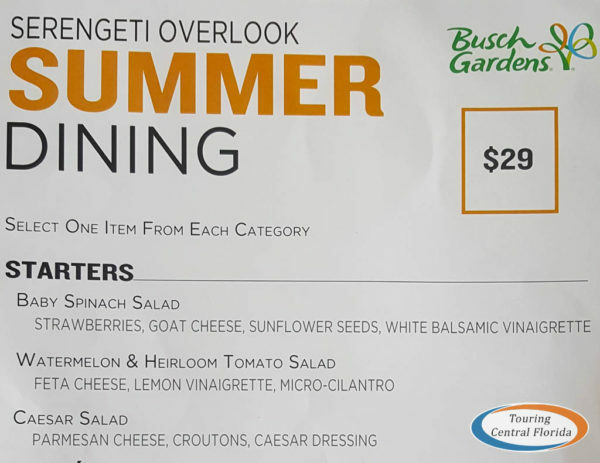 Have you tried the new Summer Dining Series at Serengeti Overlook Restaurant this summer at Busch Gardens Tampa? Leave a comment below with your opinions on the seasonal experience! Someone on the passholder FB group was reporting downstairs running out of pizza by 7 PM one day last week. Hopefully this won’t be a new ongoing problem in an attempt to reduce costs. It’s a fine line between having enough to cover all the orders and not having too much that ends up being tossed out as waste. Still, understandably disappointing from the guest perspective to not be able to order what’s on the menu. 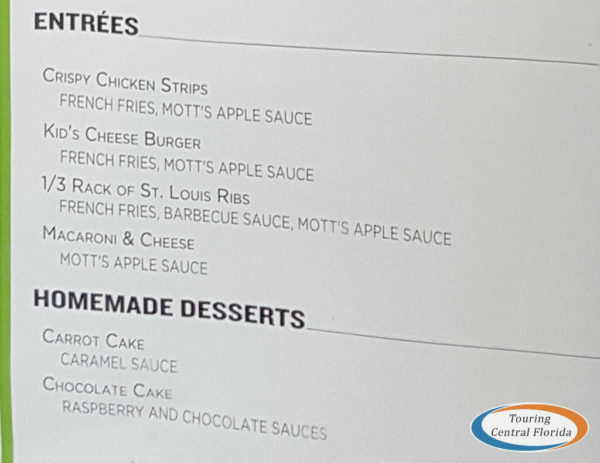 I think that ignoring other factors, it’s the park’s responsibility to ensure a reasonable level of guest satisfaction, particularly with advertised offerings (like the peaches) and standard menu items. I’m not sure if there is one, but a donation program could deal with over purchased food product. Hope they are well stocked for you this evening! Feel free to return here and leave a comment on your experience.